Cotton Gods is an original 100% Organic Vape Cotton, developed to give you the purest flavour from you RDAs and RTAs. Made from naturally grown Organic Cotton from America. Designed to give No dry hits thanks to its easy wicking, and with no break in period this truly is cotton sent from the Vape Gods above. 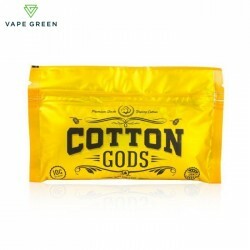 Cotton Gods Vape Cotton is designed to withstand high temperatures making it the one and only cotton you will ever need for your Vaping needs. Received cotton the follow day, the toffee was a nice touch - thank you for that. The cotton really wasn't for me but it was worth a try, I vape at relatively low wattage and found it muted the taste, it probably works better at higher wattage. Cotton Gods is an original 100% Organic Vape Cotton, developed to give you the purest flavour from you RDAs and RTAs. Made from naturally grown Organic Cotton from America. Designed to give No dry hits thanks to its easy wicking, and with no break in period this truly is cotton sent from the Vape Gods above.